“While Visions of Sugar Plums Danced in Their Heads”. Ah, yes. As gardeners we dream big, and envision cultivating spectacular gardens... Let’s give voice to your dream. Your garden is your personal story and it should reflect you. How do you want your garden space to look? How do you want to feel when you walk into the area? Do you want straight vegetable rows or a free-form permaculture-style garden? Would your orchard be laid out in a grid or casually integrated throughout the landscape? Are the annual and perennial borders to grow in a relaxed English style or French parterre formality? 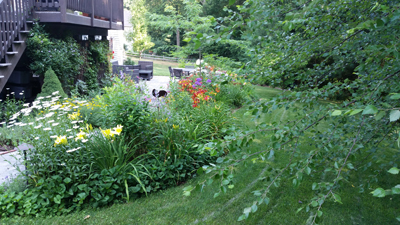 Do you want to find a quiet oasis or a vigorous riot of color when you enter your garden? Do you want a closed off private space or something open to views? What sounds will make your garden complete? The sounds of birds chirping or the quiet rush of wind through tall grass and tree leaves? What elements connect to your soul? Do you want a flowing water feature, solid stone structures, or earthy metal sculptures? Make a descriptive narrative or vision board of the look and feel that you desire for your garden. Keep it close by to keep you motivated, and as a visual reminder of your goals. This makes decisions about your garden easier- each decision should be a step toward this dream. Let this be your guide and a solid reminder is an overload of choices start to derail you. You are completing and revising your site plan this month (see our November Site article). 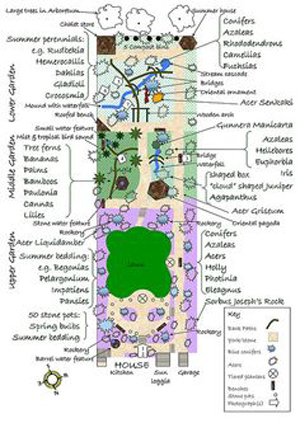 So now is the time to list everything you want in your garden area from the hardscape (patio, raised garden bed), the soft (hedges to screen a bad view, fruit trees, cutting garden) to the practical (close to watering source and garden tools) to the essential (great soil, disease resistant plants, soaker hoses and rain barrels). With your dream list in hand, let’s take a step to the practical side and start a budget for your dream. Use the square foot numbers you developed in your revised site plan to create the hardscape area budget. Winter is a good time to contact contractors for bids on patios, decks, tool sheds. With your list of desired plants create a budget for the softscape items. If your local nursery is closed for the season, go online to find the cost of plants, bulbs, etc. Include a budget for the cost of other necessary items such as garden tools, water barrels, hoses, soaker hoses & connectors, compost bins, etc. Don’t be discouraged. You will find ways to fulfill your dream-scape if not in 2017 then plan on completing your landscape in stages over multiple years. Sometimes we can find materials through on-line sales such as Craig’s List (check the free section too!) or eBay, companies that sell used or salvaged materials, or sometimes I find things for free at the swap shop of our local land fill. Also check with friends and family members, and keep an eye out for sales. All of us have found wonderful things this way. Always keep your dream list with measurements and estimated costs handy so that you can make good decisions when a bargain finds you. Experienced gardeners will tell you that their garden designs come into fruition slowly and patiently. Working from your design, you can be confident that each purchase is bringing you closer to your dream. Dream Big, and keep working on the details. 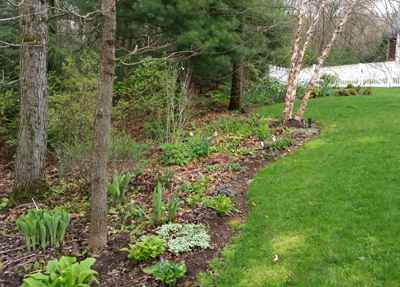 Over the next 4 months, you can have your entire garden-scape planned and ready to begin in April. Month by Month Gardening in New England, by Jacqueline Heriteau and Holly Hunter Stonehill, published by Cool Springs Press.This book will give you a nice overview of what goes into different types of gardens: Annuals & Biennials; Bulbs, Corms, Rhizomes, & Tubers; Herbs & Vegetables; Houseplants; Lawns; Perennials; Roses; Shrubs; Trees; Ground Covers; Water and Bog plants. Read the Introduction to each of this sections. Again this is an inexpensive book, packed with great gardening advice. Finish your dream site plan, and begin your monetary budget. Chapter 3 in the Vegetable Gardener’s Guide to Permaculture by Christopher Shein with Julie Thompson can help you take your plan “From Vision to Action”.This permaculture guide book can help you plan your garden even if you are creating a perennial or shrub and tree garden.